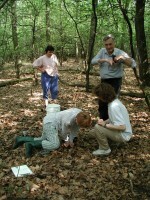 The DIRT (Detritus Input and Removal Treatments) project, which has been part of the Harvard Forest and Andrews Forest LTER research programs for several years, took on an international dimension in November 2000 with the establishment of DIRT experimental plots at the Sikfokut Forest ILTER site in Hungary. This collaboration between Hungarian and U.S. scientists is a example of how research questions can be successfully addressed across networks to extend the range of inferences possible and to strengthen ties between LTER and ILTER communities. The long-term objective of the DIRT project is to examine how rates and sources of plant litter inputs (aboveground and belowground) affect the accumulation and dynamics of soil organic matter and nutrient cycling in forests over decadal time scales. Short-term objectives include studies of soil enzymes, the soil community, soil respiration, and nitrogen cycling to evaluate how rapidly different forest ecosystems respond to litter manipulations. A network of DIRT sites has been established on which parallel measurements will be made in order to address these questions at locations with different climate, soil, and vegetation characteristics. The DIRT experiment was initiated at Harvard Forest LTER, MA in 1990 by Knute Nadelhoffer with the construction of 18 litter manipulation plots based on six treatments (Table 1). A DIRT experiment was also initiated in 1991 at Bousson Experimental Forest, PA by Rich Bowden of Allegheny College. Kate Lajtha of Oregon State University established a DIRT experiment at Andrews Forest LTER, OR in 1997. While these U.S. sites have different forest types and fertilities, a site with a high rate of nitrogen deposition was sought in order to extend the pollution gradient over which controls on soil organic matter formation and nutrient cycling could be studied. Kate Lajtha identified Sikfokut Forest as a high N deposition candidate for a DIRT site while on a field trip there during the 1999 Central and Eastern European ILTER Conference. Dr. Janos Toth of the University of Debrecen, the director of Sikfokut, was interested in collaboration and the project was born. Funding to establish the DIRT plots at Sikfokut came from the Hungarian Academy of Science. Janos Toth and Kate Lajtha secured funding from the Hungarian Academy of Science and NSF for reciprocal scientist exchanges between the US and Hungarian DIRT sites, which has enabled several US researchers to visit Sikfokut to demonstrate methods for measuring soil processes. Bruce Caldwell (Oregon State University) has led the soil enzyme research work at Sikfokut. Rich Bowden demonstrated the soda lime technique for measuring soil respiration in May of 2002. Kate Lajtha and two graduate students measured N mineralization at Sikfokut in April 2002. Kristin Vanderbilt, with NSF International Postdoctoral Fellowship funding, helped establish the plots, installed Prenart lysimeters to monitor soil solution chemistry and is also studying changes in the soil community. Hungarian visits to U.S. DIRT sites include that of Istvan Fekete, Ph.D. student at the University of Debrecen, to Andrews Forest in March 2002. Janos Toth and Maria Papp from the University of Debrecen will visit Andrews Forest and Harvard Forest DIRT sites in September 2002. Results of the DIRT study will have many applications, particularly with respect to understanding how global change may influence soil carbon stocks. The DIRT experiment will greatly enhance what little is known about long-term processes of humification and controls on soil C fluxes in forests. Already, cross-site comparisons of soil respiration between Harvard Forest and Bousson DIRT plots indicate that site fertility has a significant effect on total respiration and partitioning of respiration between roots and aboveground litter (Bouden, pers. comm.). Soil enzyme data from Andrews Forest and Sikfokut suggest that the microbial community respond to reduced litter levels within a few years of treatment (Caldwell, pers. comm.). Sikfokut Forest nicely complements the US DIRT sites, and will be a valuable reference point for how a forest subjected to decades of high N deposition responds to changes in litter quantity.